The Chinese program at UMSL will help you build the linguistic, communicative, and cultural foundations of the Chinese language and better prepare you if you want to further your Chinese studies. Why Study Chinese at UMSL? With the caring and energetic teaching faculty, you will for sure enjoy your journey as a language learner. 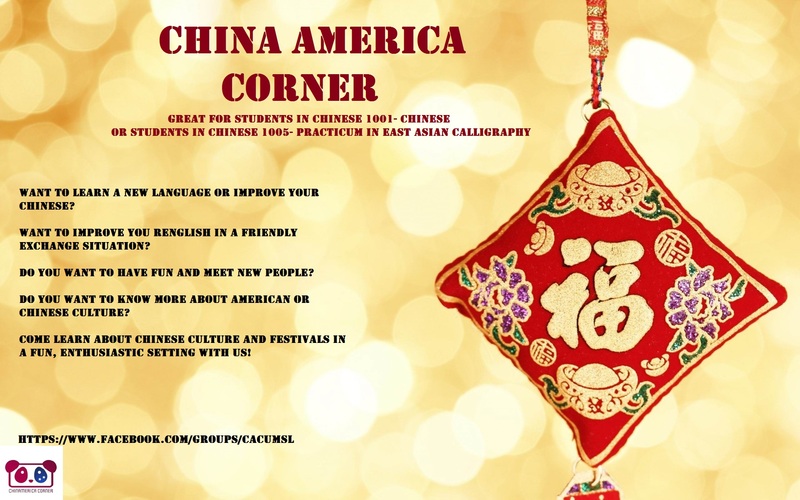 You will also be connected with China-America Corner, a student organization that aims at building a bridge and friendship between international students and American students, as well as local agencies and Chinese communities. Learning languages other than your mother tongue opens the doors to understanding its cultures, traditions, literature and people. Studying Chinese opens the door to one of the world’s oldest and richest continuous cultures, to different but splendid traditions, to the most populated nation, to the second largest economy, and to a fascinating literary world. Looking from the practical perspective, learning Chinese will provide you with job opportunities such as teaching English as Second Language in China, it may give you an edge when you interview for a position offered by companies who do business in China, and the coolest thing will be that you will better understand and communicate with more than a billion Chinese people. Another surprising fact is that Chinese has a relatively uncomplicated grammar. Chinese has no verb conjugation nor noun declension, which means you don’t have to memorize verb tenses or deal with agreement of gender and number. Chinese has the same basic word order as English: Subject—Verb—Object and you only need master a relatively small vocabulary to gain proficiency. With such a useful, not so hard as described by the “myth”, and fascinating language, anyone learning it will enjoy it and benefit from it!